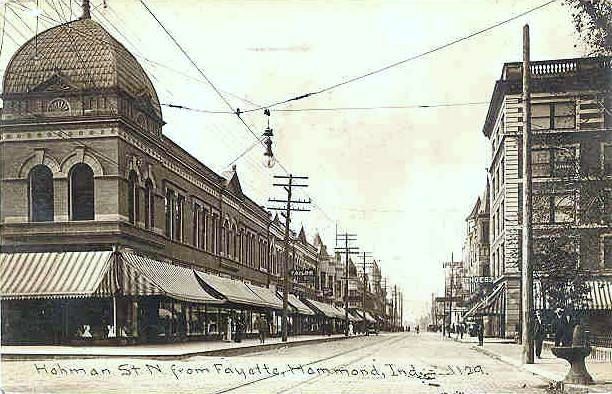 Hammond, Indiana had always been a regional shopping destination for residents of northwest Indiana. 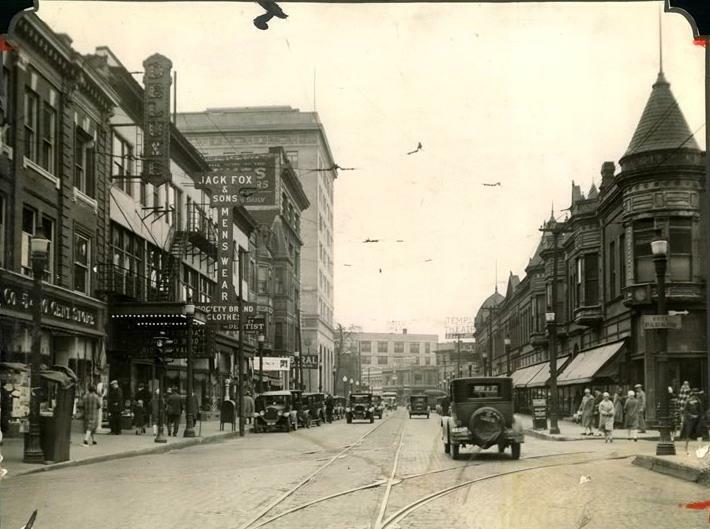 With the onset of the automobile adding to the public transportation offered by streetcars, the number of shoppers expanded and with it, the number of retail stores along Hohman Avenue and on State Street. 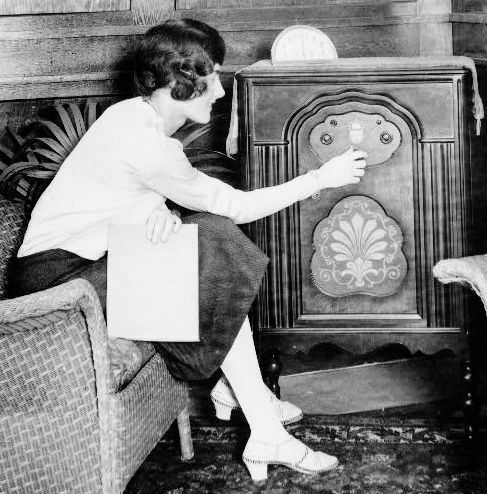 Biggest event of the 1920s decade for Hammond? Probably more photos of downtown Hammond, Indiana, have been taken from this location on Hohman Avenue than any other place. could safely be set up on the sidewalk and the photographer could look straight north for this iconic picture. the use of horse drawn carriages has diminished. Looking North on Hohman Avenue from Broken Corner. To the extreme right you can see the water fountain for horses. It was in front of Central High School (not pictured). 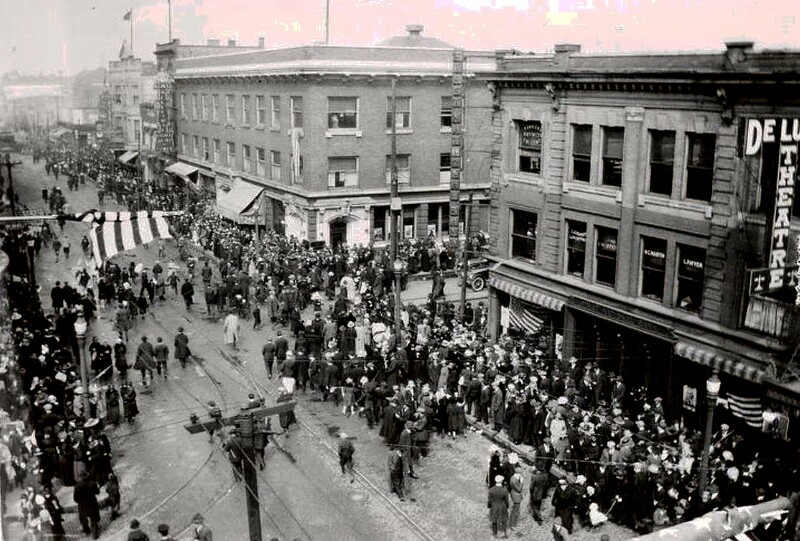 Taken from the third floor of the Goldblatt's Department Store, looking northeast at the intersection of Homan and Sibley, crowds assemble for a parade in 1917. Children relish being able to run in the streets while traffic is halted. 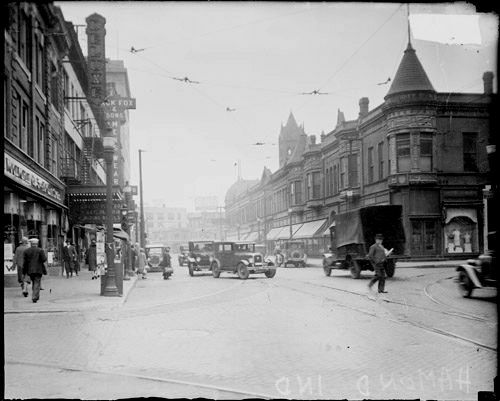 The sign for the Towle Theater can be seen at the far right. 1917 was not without its challenges. Here the Hammond Fire Department reports to a fire alarm. What do you see in this picture? 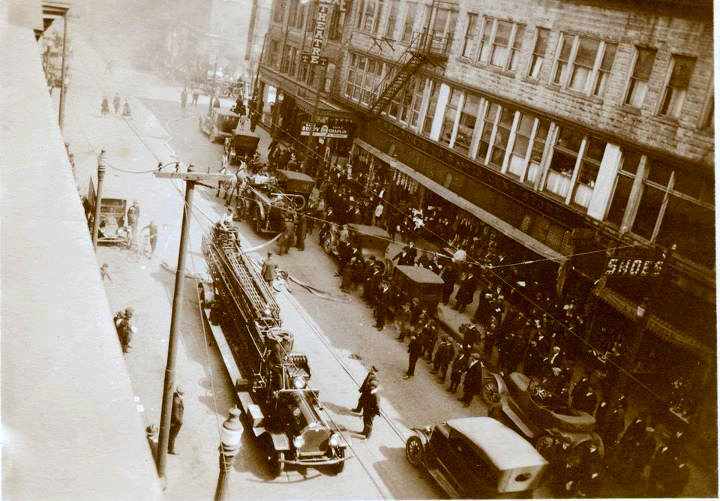 Can you see the horse drawn pumper in the middle center? Where is the fire? Look at the spectators. Where are they assembled and where are they looking? It appears it is the old Lion store (Kaufman & Wolf) is having a fire... The fire engine with the ladder will reach the roof of the store that is on fire, but wait! Can you put the ladder up against the building with the power lines in the way? And where is the photographer who took this picture? Is he on the roof of the burning building? 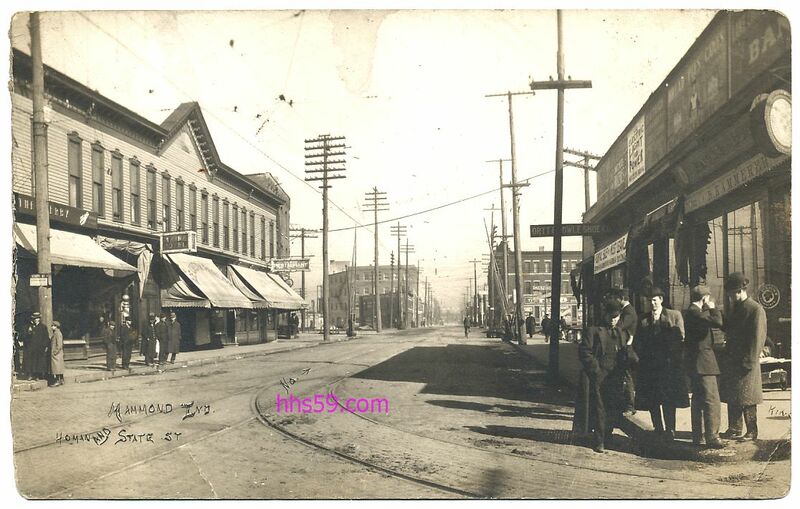 This rare 1911 high resolution image is taken from the corner of Hohman Avenue & State Street, looking North. The hotel on the left (west side of Hohman) is named the Maine Hotel and was later to become the Indiana Hotel. The railroad tracks comprise "the Diamond" where two sets of rails intersect with one another. 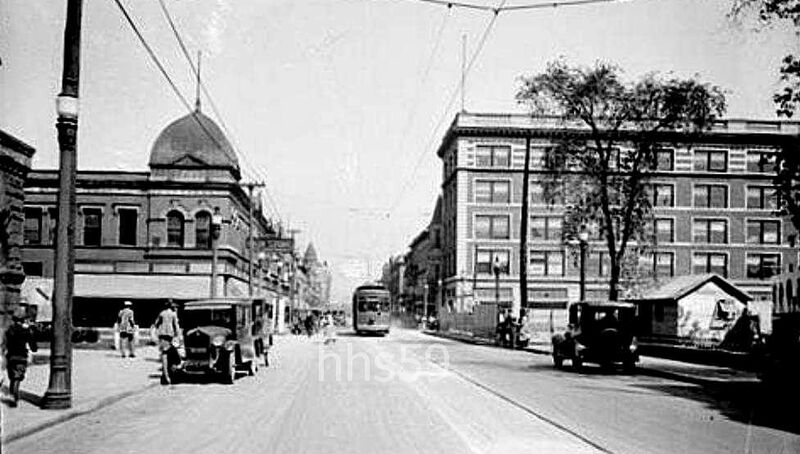 Streetcars were used constantly to get around the region. A man on a bicycle can be seen peddling north near the railroad crossing. 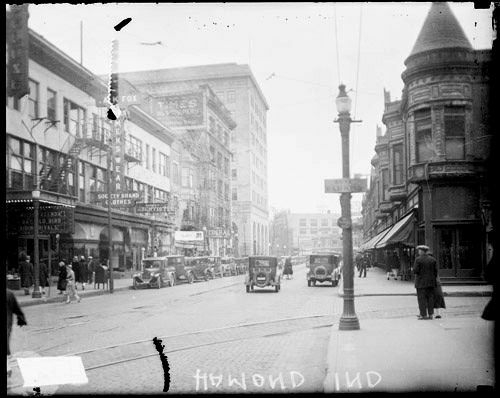 Hammond, Indiana, during the 1920s. Hohman and Sibley shows active retail shopping and automotive traffic. 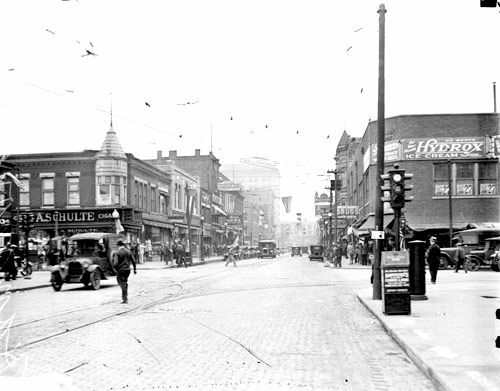 Hohman Avenue and State Street (then called Ivy) shows active retail shopping and automotive traffic. complex and is located at the right of the building (west end). and it was very popular when temperatures outside soared. If you copy any of the images on hhs59.com, please give credit to us or to our sources. It helps those doing archival research. If you own any of the original images on hhs59.com, please let us know and we will give you credit as being the source of that image. These images and the web pages are maintained by Richard Barnes, HHS'59.